The Global Financial Crisis (GFC) of 2008 and succeeding sovereign debt crisis is still making its impact felt in Europe in sluggish growth and high unemployment, particularly in the periphery. Despite, apparently buoyant and benign growth in 2017 and the glittering figure 0.6% in the 3rd quarter of 2017, output is still well below the long-term trend. However, in terms of macroeconomic aggregates, the situation has not improved tremendously. The levels of sovereign debt in the Euro area have remained high reaching 90% of GDP. Interventions in the form of Quantitative Easing (QE) or the Asset Purchase Program (APP) might have led to a decrease of yields in the Eurozone, however, whilst lowering yield leads to lower sovereign borrowing costs, it has very little to do with the high levels of accumulated debt which constrains and limits fiscal manoeuvrability. Nonetheless, ‘debt suitability is still sensitive to economic shocks‘. Compared to the US and the UK, it took the Eurozone four and six years longer respectively to make up for the GDP losses caused by the GFC (Figure 1). 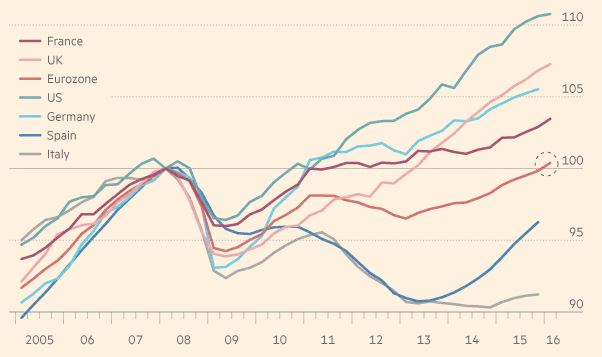 On average, the Eurozone has grown at a slower rate than Japan, UK and the US since the GFC. In terms of the labour market, although unemployment has been very high across the EU, the situation is worst in countries like Greece and Italy where around 20% of the labour force has been unemployed. The high and persistent levels of unemployment are a major issue for Europe’s long-term economic prospect. Perhaps, in Keynes words, ‘the outstanding faults of the economic society in which we live are its failure to provide for full employment and its arbitrary and inequitable distribution of wealth and incomes‘. A notable point requires emphasis here: in the presence of very high unemployment, slow growth and huge sovereign debt, expecting productivity growth to shoot-off is a flight of fancy. The sluggish recovery implies it may take even a few more years for some countries (Greece, Spain and Italy) to catch-up with their pre-crises GDP. Once what was perceived to be a lost decade (a term initially used for Japan by Hayashi and Prescott) now seems to be more than that, causing fears of a lost generation or even a ‘new normal’ altogether. As Larry Summers pointed out, there have been potential GDP losses of over €1 trillion since 2008; Figure 2 clearly depicts this point. Is this the new normal or can efforts be made to make up for the losses or at least regain the pre-crisis trajectory? Figure 2: Advanced Economies log Real GDP and extrapolated trend (Index, 2000=100), Source: Blanchard and Summers (2017). In the story of Japan’s lost decade, growth was constrained due to adverse credit conditions particularly for the small firms, lack of investment, stagnation of household consumption, a decline in household wealth, uncertainty about the future and a lack of coordinated monetary policy. Most of these factors are unambiguously manifest in Europe, particularly an environment of low investment especially after the GFC (Figure 3). Investment is needed across Europe, including in Germany, the largest and strongest economy in Europe, which has festering infrastructure that needs substantial public investment. Low investment in the Eurozone and the decline in public investment, financial fragmentation, and high levels of economic uncertainty implies an economic environment somewhat similar to the one famously categorised as ‘secular stagnation‘. According to Nicholas Crafts, ‘the risks of secular stagnation are much greater in depressed Eurozone economies than in the US, due to less favourable demographics, lower productivity growth, the burden of fiscal consolidation, and the ECB’s strict focus on low inflation’. There are some suggestions for raising demand by increasing investment. Studies by IMF staff argued that it is ‘Time for an Infrastructure Push’ while Beniamino Moro urged countries like Germany to take an expansionary fiscal stance which can accommodate the fiscal consolidation elsewhere. It is a seemingly logical argument, yet the Eurozone is a monetary union without a fiscal union which brings a new set of challenges. Nonetheless, Europe’s fiscal rules, leaving little space for the fiscal policy to manoeuvre, just add to the challenge. Germany politicians argue that the government does not have space to run a budget deficit and so the balanced budget act has has pulled the ‘debt brake’ Schuldenbremse) on growth. There are huge public investment needs in German infrastructure whereas, in reality, the German budget surplus is only €23.7 billion which cannot fulfil the unmet government spending needs. The self-imposed fiscal constraint is, in fact, a ‘straightjacket‘ and the debt brake is the brake on the locomotive of European growth. The remedy tried in the EMU seems to be what Brendan Sheehan described as ‘constructionist cure‘ where the burden of adjustment is placed on the shoulders of deficit countries and is to be achieved through deflation, lower economic activity and high unemployment. In fact, the Eurozone crises is not a crisis of the balance of payments but of flawed design. Reflecting on some of these flaws, Ángel Ubide of Goldman Sachs has urged on ‘A New Fiscal Policy for Europe’ reasoning that ‘the Stability and Growth Pact (SGP) was created for a world that no longer exists’. Therefore, he proposed Stability Bonds ‘issued by a European Debt Agency to finance the debt of euro area countries up to 25 percent of GDP, backed by tax revenues’. While Ubide is correct to reflect on the limitations of monetary policy, the need of fiscal activism and stagnation in Europe, the proposed solution of issuing stability bonds despite their unquestionable benefits has some limitations. In the current state of affairs, they would only add to the existing stock of debt and make the debt overhang worst. A bond issue worth 25% of the Eurozone’s GDP means a debt issuance of € 4–4.5 trillion. Who will buy this debt? What implications will it have for the financial stability? The ECB cannot buy it and if private sector holds this debt (twice the size of QE and APP), it will literally mop-up the liquidity in the system. 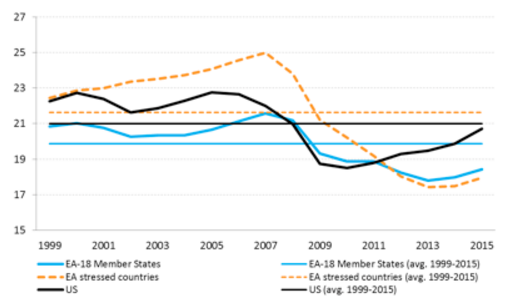 Parallel to the stagnation, output losses, and restricted fiscal space in a monetary union another issue is a build-up of TARGET2 balances (Trans-European Automated Real-time Gross Settlement Express Transfer System). Having certain similarities and dissimilarities with the International Currency Union Plan proposed by Keynes in 1940s, there are some inherent weaknesses in the Euro-system manifested in the large claims and liabilities on the balance sheets of national central banks of Eurozone members. In terms of size, these balance entries have piled up so much so that some central banks, for example, the Bundesbank has ‘Intra-Euro-system’ credit equal to 25% of the national income of Germany, as shown in Figure 4. These imbalances have sparked debate about their existence and the implications for the Eurozone. While some declared them to be ‘the ECB’s secret bailout strategy‘ or making Germany a hostage to the monetary union, others argued that they are actually due to the monetary policy operation and/or flight of capital not entirely down to the current account deficit. Moreover, German savers and financial institutions have hugely benefited due to the presence of Euro-system and TARGET2 imbalances as they provide financial stability in Germany due to the risk transfer from the private sector to central banks. Despite the controversy on origin and implications of TARGET2 imbalances, at least, there is consensus that they must be settled but the big question is how? There are not many proposals on the table and few suggestions are for either constrain borrowing or to introduce annual redemption with marketable assets. The major objection on having a constraint on borrowing is that it goes against the spirit of monetary union and can hit the surplus countries. Nonetheless, Karl Whelan cautioned that an enforcement to honour liabilities without drawing on funding from ECB could cause a fire-sale of assets and potentially a financial crisis in the Eurozone. Moreover, capital controls are prohibited in EU according to Article 63 of the European Treaty. It is vital to resolve the issues in an optimal way; the strategy of ‘kicking the can’ is neither suitable for deficits nor appropriate for surplus countries. Some estimates suggest ‘buying time is costly‘ and it had an accumulated loss of € 17 billion in real terms to Germany. It is not in the interest of Germany or any other surplus country to prolong the imbalances, particularly when the interest rates are low. Nonetheless, as inflation starts to pick-up this cost may substantially increase. While the existence of TARGET2 balances may not pose an immediate risk for the Euro system, they are at least a symptom of underlying wider problems which shall be resolved. Again, the big question is how? The optimal solution is one that is effective in solving the problems of self-inflicting secular stagnation and the TARGET2 imbalances and is also fair and equitable. Nonetheless, it does not require urging Germany and other surplus countries to run large budget and trade deficits, advice which they might be reluctant to follow anyway. Logically, in the presence of the Germany’s huge current account surplus, it is difficult to see how periphery countries can achieve export-led growth because this requires external demand. Concomitantly, in this context, it is reasonable to argue for an expansionary stance by Germany to create that demand, particularly if we consider its own infrastructure needs. Yet, the fiscal space extremely constrained. These factors provide the context for a potential proposal which is robust against the free rider and moral hazard problems. It is proposed that the TARGET2 balances are settled by an adjustment to the monetary base in the Eurozone. Under the proposed approach Euro members are allowed to withdraw from the Euro-system according to their paid-up capital which then can be adjusted against their net claims on the Euro-system. In so doing, the countries with the largest share like Germany which also have large surpluses will gain most in terms of their share from the settlement, while the countries like Italy with large capital-key yet a large deficit will be able to settle their claims. In essence, the suggested approach will be a fair mechanism, based on their capital-key weights. The reason and logic for doing so is also manifest in the fact that National Central Banks (NCBs) including the Bundesbank are ECB shareholders, participating in the profit and losses made by the entire Euro-system. It would be similar to following the existing rules on profit sharing by the NCBs which they concomitantly handover to the corresponding sovereign states. One may rightly see this proposal as an adjustment to the monetary base (which is one aspect but not the whole of this picture) and raise concerns about price level, however, the evidence and facts about the deflationary pressure in the EU suggest otherwise. By a simple and logical comparison, if the APP of over €2 trillion has not created an inflationary pressure, the settlement of TARGET2 and a monetary adjustment of relatively smaller size should not be seen as a major threat. Lastly, the empirical evidence on this aspect also suggests that the relationship between monetary aggregate and inflation is weak, particularly for low inflation countries. As the proposed approach is set out, it is prone to critique and rigorous examination. The very first question to ask is what could be the consequences of doing so? In this context, the proposed approach where the repatriation of gains is on the basis of capital key weights would cater for the desperate needs of European (in particular German) infrastructural regeneration but also stimulate growth. The proposed policy will have effects on four orders/tiers. In the immediate and first-order implications, it will lead to an increase in liquidity at the EMU level. The empirical evidence suggests there would be considerable gains in terms of economic growth, investment, consumption, wages, stock markets as well as exports and imports. In the secondary and tertiary impacts, there would be an increase in liquidity at the country level and the creation of much needed fiscal space for Eurozone members. The proposed approach will be in particular helpful for Germany to address its infrastructure needs, settlement of large external surplus without running a budget deficit or breaching the balanced budget act. Furthermore, it would also help to curb high and persistent unemployment in the periphery. Lastly, there would be quaternary effects, coming from the fiscal and monetary spillovers. There is some concrete evidence of positive effects of cross-countries spillovers. In terms of implementation, the proposed strategy can be used as an unconventional tool of the Eurozone’s monetary policy. As it stands, the proposed policy is fair, equitable and the cost is comparable with the stimulative efforts put in so far.